You don't have to see a chiropractor three times a week forever! When I give lectures and workshops, people often say to me “But if I start seeing a chiropractor, don’t I have to keep going forever?” The answer I give them is a resounding NO!. You do not need to see a chiropractor forever once you start seeing one. 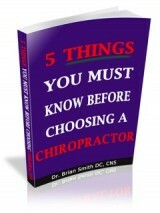 You need to know that it’s your body and it’s your health so it’s your choice about how long you see a chiropractor. The main reason people get confused about having to see a chiropractor “forever” comes from not understanding the types of care chiropractors offer. People often begin seeing a chiropractor because they are in pain. When a chiropractor is treating a person who is in pain, that person is receiving what most chiropractors call “Relief Care”. The purpose of relief care is to get you out of pain as quick as possible. During this time it is not uncommon to see a person 3 times a week (or more) to try to accomplish the pain relief as fast as possible. Let’s face it, when you’re in pain, do you want to doctor to give you relief more slowly so he doesn’t have to see you so often, or do you want to get out of pain as fast as you can? Once a person’s pain has been eliminated (or at least reduced greatly) it is their choice whether or not to move on to “Stabilization Care”. In this phase of care, the doctor and patient work together to stabilize the corrections they’ve made during relief care so that the relief / corrections last. In other words, more adjustments and often exercises are given so that the person’s pain doesn’t come back as soon as they stop seeing the chiropractor. I like to explain Stabilization Care to my patients this way – when you were in pain, your muscles and joints tried to protect your problem from getting worse by trying to hold your body in a certain position. By doing that, your body got into a “habit”, and while this habit served a purpose in the short run, in the long run it will make your problem even worse if it were to persist. So once we help eliminate your pain, if you want to minimize the chances of it coming back, we need to do more work so that your body develops a new, healthier “habit”. That new habit involves improving the movement of your joints and muscles along with normalizing your posture so that it is less likely that your pain comes back. Finally, there is “Maintenance Care” or “Preventive Care”. Once you are out of pain and your condition has stabilized, your chiropractor may offer you the chance to come into the office at some interval to get checked and get adjusted as a means of maintaining your spine and preventing problems from returning. The idea is to fix small problems before they become big ones. How often a person needs maintenance depends on the person – the most common frequency is once a month, but someone who has a job or hobby that puts a lot of stress on their spine and other joints may respond best by coming every two weeks. It all depends on the person. The confusion about having to go forever happens when the chiropractor doesn’t explain these phases of care to the patient and just moves them from one to the other without explaining why. A person who doesn’t understand these phases of care soon begins wondering why he or she is still seeing the chiropractor when their back no longer hurts. Most people choose to at least go through “Stabilization Care” if it’s explained to them. In my office the patient ALWAYS has the choice of what type care he or she wants. At each stage I explain what we’re doing for their problem and why, and then I give them the choice on how they want to proceed. Most choose to go all the way through Stabilization Care, many choose maintenance or preventive care, while some just want relief care. Whatever their choice is, I honor their wishes and tell them I’m there for them should they ever change their mind or need more care. I’ll be honest, I have been seeing some of my patients for years, but that’s only because THEY CHOOSE to come in regularly because, as they tell me, they feel much better when they do. Contact us to find out if we are a right fit for you! I too erroneously thought that once one started seeing a chiropractor they would need to continue that for the rest of their life. I do love that the three phases are available, just in case someone feels strongly about getting ongoing care and adjustments. And I think that stabilization is so important; if you stop after relief care how will your body go back to normal? That's what I worry about, as far as traditional medicine goes. I feel like I can now go to a chiropractor and feel confident in my choice in care length; thank you!